If your fitness is more rut than routine, restart your body’s engine with three new approaches. The Power Institute (powerin stitute.com) is a Toronto boutique fitness facility training more mature types with amped-up, high-tech, medically certified equipment that works together to accelerate exercise and fat loss results. Power Plate is a vibrating platform on which cardiovascular and body-weight training exercises are performed to increase strength, muscle tone and the body’s ability to excrete fat and toxins – all key to the body aging well, with less injury, risk of falls and healthier cell production. This is rocket science, used by Russian cosmonauts in the ’60s to prevent muscle and bone loss in zero gravity. The Power Plate fitness equipment uses an acceleration training method, where a balance platform vibrates 25 to 50 times a second. This sends waves of energy through the body that cause muscle contractions. “What’s great about the Power Plate is that it works from the inside out, activating muscle tissue just by physically being on the plate, even without doing dynamic, moving exercises,” explains Power Institute co-founder Ron Das. It’s not a huge effort to stand on the Power Plate. As co-founder and trainer Darryl Bodington hits the start button, a vibration runs up my feet, into my legs, hips and right to the top of my head. The vibration feels very smooth – perhaps a little weird at first – but not unpleasant. Just as I’m getting used to the sensation, the real 30-minute workout begins with a variety of old-school functional movements like lunges, squats and push-ups using my own body weight – all while balancing on the plate, and my muscles fatigue quickly. Only minutes into the workout, my legs feel like they’re about to blow. At the 20-minute mark, I’m drained, which is apparently a good sign. As we wrap up, the machine frequency is set for a deep, relaxing massage that helps tremendously with recovery. After I return for my fifth workout, I notice tone in my thighs and a lower-abs tightness I haven’t felt in years. Encouraging research suggests the low-impact energy waves in acceleration training are particularly beneficial for seniors looking to regenerate muscles, improve balance, increase strength and flexibility, reduce pain, soreness and recover faster. For contraindications, Dr. Paul Dorian, director of the cardiology division at University of Toronto and a cardiologist at St Michael’s Hospital, advises people with recent heart failure, surgery or under the recent care of a cardiologist to discuss this first with their physician. 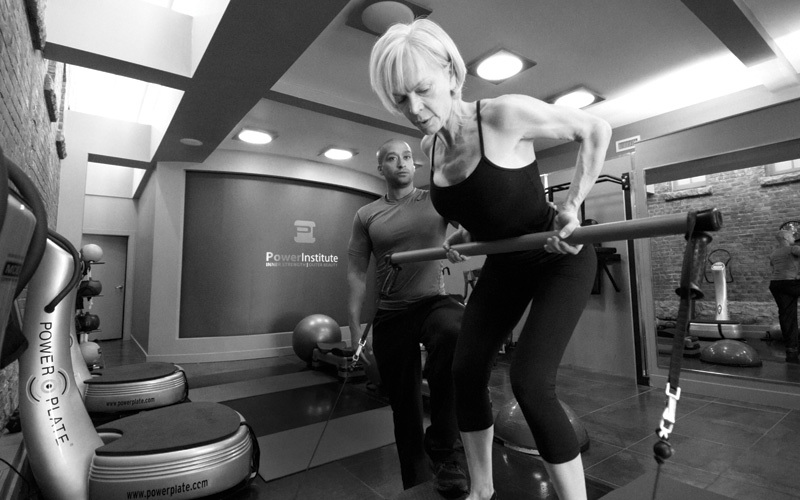 So after heart surgery, Bob Berman, then 57, turned to the Power Plate to get back into shape. “I had surgery December 2011 and started working out very gently with Darryl on Feb. 1, 2012. By that summer, I was practically back in shape and, in October, I ran a marathon. It’s a worthwhile form of exercise that has certainly helped me,” says Berman. There’s also evidence that Power Plate training strengthens muscles and this protects the joints and reduces pain, adds Dorian. When Dr. Esther Gelcer, 70-something, discovered she was at risk of developing osteoporosis, “instead of taking medication, I started exercising three times a week with the folks at Power Institute on a regular basis,” she says. “Three years later, another bone density test was perfectly normal. The doctor said my bones are like a teenager’s,” adds Gelcer. “Also my arthritic pain has mostly disappeared.” Find a Power Plate facility and certified trainer near you at www.powerplate.com. I’ve tried many types of yoga. Hatha yoga was my first practice, thanks to Raquel Welch’s Total Beauty and Fitness video. There was Bikram hot yoga in a room heated to 37 C; I’ve even tried laughter yoga and, most recently, Kundalini. But hanging airborne from the ceiling, dangling from a rope in a piece of fabric? The thought never crossed my mind until I learned of a new discipline of yoga called aerial yoga, which involves using a hammock of aerial silk – the same type used by Cirque du Soleil – to elevate and support the body as you lean, hang, push, pull and hold yourself in yoga poses. Call me crazy, but it just looked like fun. “I love aerial yoga because it’s anti-aging for the spine, bones and joints,” says Angela Caliendo, 49, an aerial yoga instructor with a 50-plus clientele. “During the inversions (going upside down) when you’re hanging from your hips, for example, everything is actually decompressing, creating space between the vertebrae. It decompresses tight joints, relieves spinal pressure between the vertebrae and helps lengthen the muscles,” explains Caliendo. She says for the aging, aerial yoga leads to improved core strength, flexibility, joint mobility, balance and overall agility which are crucial aspects in the prevention of falls. “It’s a form of yoga and Pilates, not circus acrobatics, and you actually use the silk hammock as a prop, just like you would use a strap, blanket or any other prop,” adds Caliendo. To learn about this unique yoga practice, I decided to try the aerial yoga class at Fly Studio (flyqueenwest.com). In a loft-style studio, 10 nylon fabric slings (also called yoga silk or hammocks) are spaced out evenly across the front half of the room. 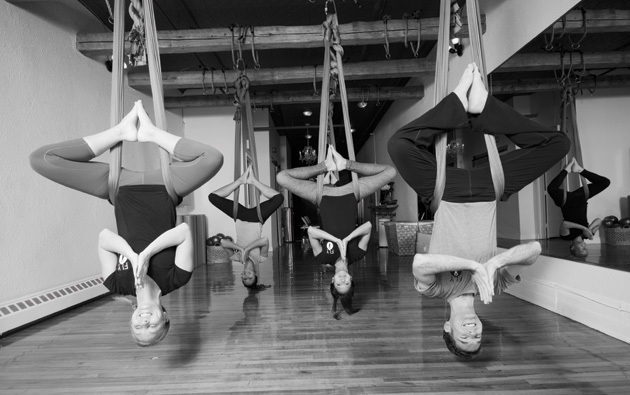 The nylon fabric slings hang from wooden ceiling beams using equipment specific for aerial yoga and other circus acts. The most important thing is learning to trust that the silks will hold your weight. “The equipment has been tested and is regularly serviced to ensure the safety of all our classes,” says Fly Studio instructor Ariel Whittaker-Brown. The yoga silk is hung close enough to the floor so that we can use it to either partially or fully support our body weight. Next, we start by wrapping the silk across our upper backs and under our arms, then leaning back a bit to stretch the upper back and shoulders. Soon, Whittaker-Brown has me in positions I would never have thought my body capable of. Standing in front of the silk, we put it under our hipbones and fold forward. With hands and feet on the ground, we do a supported downward dog. She encourages us to walk our hands forward a bit and let our feet come off the ground into a handstand. The last time I did a handstand, I was 10 and had my hair in plaits. There’s a lot of giggling and I keep thinking of the Diana Ross disco hit “Upside Down.” Yet, with the fabric wrapped around my legs acting as a harness to support me, it’s a success. I found that flipping upside down might seem a bit odd but, with expert coaching, it’s really not so scary. In the final ‘inverted pigeon pose’ my legs are entwined in the hammock so I can lean back until I’m upside down, arms hanging free and my head a few inches above the floor. I fold my legs into a diamond shape, soles of my feet touching. It’s very relaxing, and my body’s tensions are melting away. We end with a final Savasana resting pose that has everyone lying down in their hammock for at least five minutes, during which time I feel like just going to sleep. I think aerial yoga is a great supplement to other workouts. As someone who does some resistance training, running and a lot of power walks, I get really tight hamstrings and shoulders and definitely feel I got a deeper stretch with the aerial because I was supported by the hammock. More than anything, it’s just plain fun! Inversions are not recommended for people with severe vertigo, untreated high or low blood pressure, glaucoma, pregnancy, heart conditions or heart surgery. Ever since the original Hawaii Five-O TV series, I’ve been smitten with the surfer girl fantasy. I’ve loved the glamour of the sport – the bronzed and lithe physiques, the serene sun-kissed vibe, the grace and beauty of the movements – as well as surf-culture’s influence on fashion, music and, of course, movies. When I finally gave surfing a try on vacation, I was horrible at it. I’m not a strong swimmer and tend to panic at the thought of cold waves crashing over my head and getting stung by jellyfish. I haven’t attempted it since, but the allure of surfing persists. That’s why I’m at the studio of Surfset Toronto (surfsettoronto.com), a new indoor surf-inspired fitness class where I can get to practise carving waves in relative safety close to the floor and live out my surfer girl fantasies. There’s been quite a buzz about Surfset since it was a winning business idea on the TV show Shark Tank in the fall of 2012. The Toronto classes attract a wide variety of ages and surfing experience. Alexandra Vinichenko, co-owner and instructor whose toned body is great advertisement for the class, introduces us to the RipSurfer X, the board built to mimic the instability of being on water. Three air-filled stability balls prop the board up 11 inches off the ground, while four bungee cords provide stability by controlling how much it teeters. Most of the top of the board is covered with black matting, which is more comfortable on the feet, knees and wrists. The first step in surfing is learning to get your sea legs even while on solid land and standing only a few inches off the floor. Vinichenko asks us to step slowly onto the board, shifting our weight from left to right foot. Am I a natural? Hardly! Immediately, the stability balls roll under the board; I wobble like crazy and wipe out onto the padded floor. It isn’t pretty, but I press on. We practise our surf stance, with feet wide on the board and use our toes and heels to carve the board side to side. To my surprise though, within a few minutes I’ve adjusted enough to focus on the fun of the workout – without falling off the board. There’s a lot of core work like planks and crunches, as well as squats and push-ups; everything heightened by the added challenge of staying balanced on the board. 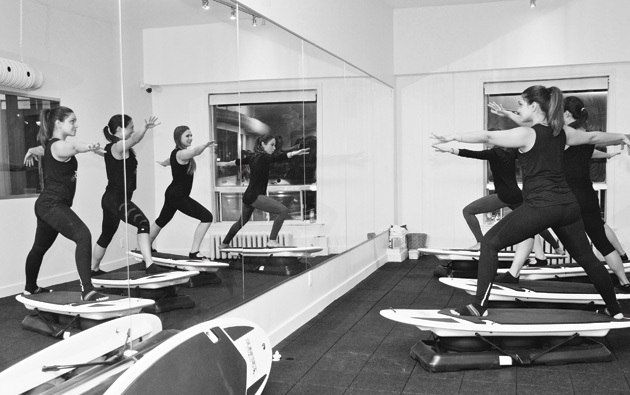 Wave runners – Surfset’s version of mountain climbers – jack up the heart rate so you break a sweat. The hardest moves for staying balanced are when we’re stretched out on our backs with feet flat and knees bent; it feels like I’m going to roll right off. When we lift into bridge, I have to hang on. Still, I like the constant effort required to balance on the board and can absolutely feel my core working throughout. “This next move is challenging, but I’m sure you guys will have fun with it,” yells Vinichenko. We’re finally ready to do the surf pop-up, a move required to ride a wave. Lying flat on the board, I paddle with my arms and legs like I’m swimming, then push up, hop one leg forward and stand up. It’s exactly what you’ve seen in any surf video, how a surfer gets up on her board. I imagine I’m at the beach, heading out toward a rolling white froth of surf, feeling all Kate Bosworth in Blue Crush. For a fleeting but exhilarating moment, I feel like I’m a surfer chick until I fail to catch a wave – meaning I tumble off the board. I get it a few times, almost face-plant once and have a blast throughout. Even though I stood for only a few seconds at a time, the balancing act has my core and quad muscles burning, while my arms ache from the paddling. Surfset is a fun way to add variety to a fitness plan and, by the end of the class, I’m inspired to give the sport another go – outdoors and in. Developed in France to treat the skin of burn victims, Lipomassage using the LPG Endermologie (lpgendermologie.ca) machine is a treatment for increasing circulation and lymphatic drainage. It’s been approved by Health Canada and the FDA in the U.S. to alleviate muscle soreness, improve local blood and lymphatic circulation as well as relax muscle spasms, relieve muscle tension and increase functional mobility. The deep massage is also said to help the appearance of cellulite and fatty deposits on the stomach and back because it’s thought “to stimulate lipolysis, the breakdown of fats released into the lymphatic system and expelled as waste,” says Power Institute co-founder Lissa Hostland. The massage itself was a strange sensation, something like a vacuum cleaner with rollers in it. I won’t lie to you: it’s not pain-free but certainly manageable. After six sessions, I can’t say it’s a miracle, but my skin does look smoother, less dimpled and feels tighter, like I’ve been working out a lot. Tip: Throughout the process, it is important to drink at least eight glasses of water daily to flush waste from the body while hydrating muscles and other tissues.